(Nanowerk Spotlight) Water treatment technologies to remove contaminants from waste water can be made more efficient by incorporating nanomembranes or catalytic nanoparticles (get more insights into how nanotechnology is applied to water treatment). Compared to conventional treatment techniques, the use of catalysts, especially nanoparticle catalysts, can shorten treatment time, target recalcitrant substances, and selectively transform wastes into valuable products for instance by recovering carbon, nitrogen and phosphorus. An issue with these systems is the expense associated with the initial investment and subsequent replenishment of catalysts. The reason for the high cost of catalytic water treatment is the use of expensive noble metals such as platinum and palladium for catalyzing the degradation of environmental contaminants. In the quest to find equally effective – in some cases even more effective – yet less expensive catalyst alternatives, researchers have developed bimetallic alloys by blending a noble metal nanoparticles with cheaper promoter metals such as copper and nickel. The blending ratio of these metals is an important parameter that controls the reactivity of alloy nanocatalysts. The challenge with this approach is how to find the composition of alloy nanoparticles that show the greatest catalytic reactivity for a contaminant of interest. Doing this requires the synthesis of a series of different nanoparticles which then each needs to be screened for their catalytic activity. Researchers at the University of Notre Dame now have successfully synthesized suspended platinum/nickel nanoalloys using a cycle-controlled microwave-assisted polyol reduction method. 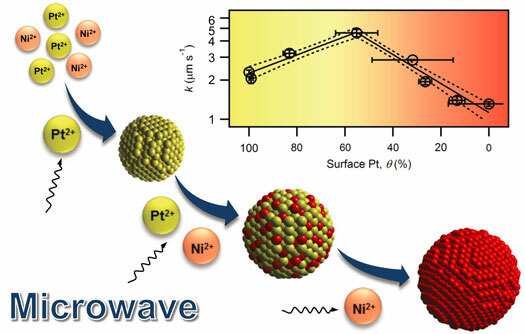 The metal alloy nanoparticles synthesized by this method have a dynamic structure. For example, in the synthesis of platinum (Pt) and nickel (Ni) nanoalloy, a Pt core forms first, which then catalyzes the reduction of Ni2+. Ni then blends with Pt, giving a Pt/Ni alloy shell. After platinum is exhausted, the new shell is completely made of nickel. The team, led by Chongzheng Na, an Assistant Professor in the Department of Civil and Environmental Engineering and Earth Sciences, reported their findings in the August 7, 2014 online edition of Applied Catalysis B: Environmental ("Microwave-assisted optimization of platinum-nickel nanoalloys for catalytic water treatment"). "Our one-pot method creates nanoparticles with a range of surface compositions without much change of the particle size," Hanyu Ma, a Ph.D. student in Na's group, tells Nanowerk. "The varied surface compositions permit the rapid determination of the optimal Pt/Ni composition to be used as an effective nanoalloy for reducing the model water contaminant p-nitrophenol." As Na and his team point out, the adoption of this facile synthesis method in catalyst designs may permit the rapid screening of nanoalloys for other water contaminants. Given the compositional dynamics of this technique, a series of nanoalloys with different surface compositions can be quickly synthesized using a single starting solution and the optimal metal ratio experimentally determined to find the best catalytic reactivity for degrading the pollutant. Ma explains that the structure-activity relationship of alloys is often linked to the averaged composition of an entire particle. "As we have shown in our paper, the average composition could misrepresent the real composition on surface, where reactions occur," he says. "With active control of the surface composition, we now can ensure that the reactivity is linked to the correct composition of a nanoalloy." The researchers note that when the precursors of a noble metal and a transition metal react with a mild reactant such as polyol solvents, their difference in redox potential plays an important role, controlling which metal is reduced and which is not. "As far as we know, this has not been discussed explicitly in the past, particularly when microwave irradiation is used," adds Ma. "At the beginning of the synthesis, the solvent absorbs microwaves and thus is heated to an above-ambient temperature. At this temperature, polyol can only reduce noble metal cations so noble metal nanoparticles are formed. Once the nanoparticles are formed, they absorbs microwaves themselves – more than the solvent does – giving to a localized elevated temperature and forming nano hot spots around the nanoparticles. At the elevated temperature, transition metal cations can now be reduced so an alloy mixture is deposited on surface." The surface composition is controlled by the availability of noble and transition metal precursors in solution. According to the researchers, two factors play critical roles in establishing the compositional dynamics: the difference of redox potentials between noble and transition metals; and the difference of microwave absorptivity between metal nanoparticles and polyol solvent. Whereas in this present paper Na's team demonstrated the usefulness of microwave-assisted polyol reduction for synthesizing binary nanoalloys with varied surface compositions, they hope to extend its application to the synthesis of ternary, quaternary, and even more sophisticated nanoalloys.